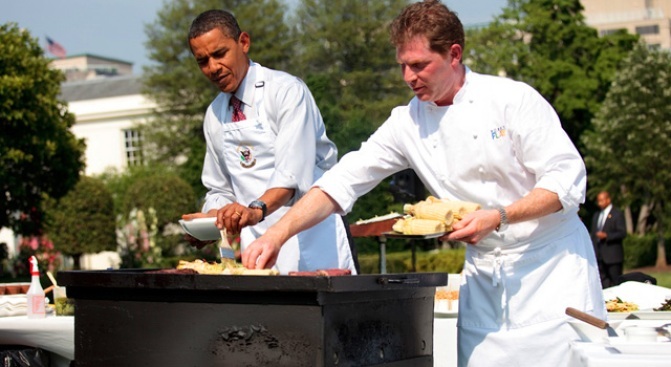 President Barack Obama and celebrity chef Bobby Flay grill steak, corn and barbeque chicken at the Kick Off Young Men's Barbeque on the South Lawn of the White House, June 19. Relax or go wild, the weekend is young and there's an endless supply of things to do. As much as we're all sick of hearing the term 'staycation' this summer, remaining local ain't so bad. HEAT THINGS UP: Urban Outfitters is clearing out their summer stock, online and in-store at their New Haven location, offering a smorgasbord of goodies for $4.99. Finds include Alexander Wang inspired tent tanks and tee's and suede-wrapped headbands that you should really stock up on before next year's Coachella road-trip. Post-sale frenzy can make your tummy grumble, and can be satiated only with ThaliToo's hot masala fries - tweaked to your heat tolerance - and a Passionfruit-infused lassi. FOR "ALL THE SINGLE LADIES": For the simplistic palette, Iron Chef and all around Food Network bully, Bobby Flay's new restaurant at Mohegan Sun, Bobby's Burger Palace, offers a selection of 'crunchify-ed,' regionally-inspired burgers - like the Philadelphia Burger smothered in provolone and griddled onions and peppers, or Santa Fe, with queso, jalapenos, and blue corn chips. And stop by Miss. Sasha Fierce herself, Beyonce, on the 23rd or for the more mellow, curb-side-prophet-turned-crooning-surfer Jason Mraz's show on July 31 at the Sun's Arena. PUTTING THE AHHHH IN SPA: Gretta Monahan, Rachael Ray's go-to gal for style, beauty, and all-around pampering advice, has prime spa real estate in the MGM Grand at Foxwoods, offering a delish menu of treatments and treats at G Spa. She also invites fans to follow her on Twitter for up-to-the-second tweets on specials and sales at all her super chic brands, including her Boston boutique Gretta Luxe and sleek salon, GrettaCole. THRIFTY THEATER: And if the weather agrees with us this weekend, catch the last weekend of the Taming of the Shew at the Cedar Grove (at Middlesex Community College) in Middletown. Think of it as the more poetic and dramatic version of 90's teen movie classic, "10 Things I Hate About You." Since the suggested donation is well, suggested (we suggest you do) feel free to guiltlessly pack an indulgent picnic, preferably from the corked and carbonated genre.